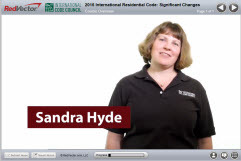 RedVector is proud to release a new course called 2015 International Residential Code (IRC): Significant Changes. This three-hour, intermediate-level video course is presented by Sandra Hyde, P.E. Sandra is a Senior Staff Engineer with the International Code Council (ICC) Product Development Group where she develops books and seminars about the structural provisions of the International Residential Code (IRC) and International Building Code (IBC). Sandra is a Registered Civil Engineer in Idaho and California, and a member of the local and national engineering and building professional associations. This course reviews and analyzes selected significant changes from Chapters 1-4 of the 2015 International Residential Code (IRC). It assists building officials, plans examiners, inspectors and design professionals in identifying the specific code changes in Chapters 1-4 that have occurred and in understanding the reason behind the changes. This course uses the Significant Changes to the International Residential Code, 2015 Edition. Topics include changes to accessory structure scoping, guard height, wind speed and exposure category determination, discussion of a new standard for sunrooms, new tables for minimum footing size, clarification of townhouse separation, emergency escape and rescue openings, stairway illumination and fire protection of floors, and a new requirement for a written statement of the reason for disapproval of an alternate material or method. By the end of this course, you will be able to identify the most significant differences between the 2012 IRC and the 2015 IRC; identify key changes in organization and code requirements; determine the applicability of new design, plan review and inspection requirements; apply changes to guard heights, wind speed and exposure requirements; and explain changes to clarified code provisions to permit applicants and contractors at the job site.